Welcome to Office2u Malaysia online store. Terms and conditions stated below applies to all visitors and users of Office2u Malaysia online store. You're bound by these terms and conditions as long as you are on www.office2u.my . The content of terms and conditions may be changed, removed or deleted at any time. Please note that Office2u Malaysia have the rights to change the contents of the terms and conditions without any prior notice. Any violation of rules and regulations of these terms and conditions, Office2u Malaysia may take necessary actions against the offender(s). All orders are considered valid upon successful of payment and subject to terms and conditions stated herein. We strongly recommend using Online Banking (CIMB Clicks, Maybank2U, PBeBank, Hong Leong Connect etc.) for instant payment and processing. You may also choose to bank in Cash or Cheque to our bank account as reflected in our order confirmation email. Kindly allow 3-5 days for payment verification of clearance if you choose to bank in cheque. PayPal is a payment method for online purchases that allows users to send and receive money online. PayPal offers a fast, safe and easy method of payment without disclosing your credit card or other financial information to the sellers. PayPal uses TLS technology to keep your information safer. In addition, when you send a payment using PayPal, PayPal does not share your financial information with the sellers. If you would like to make your payment with your credit / debit card, you do not necessarily need to open a PayPal account. Non-PayPal account holders may make payments using their credit/debit cards by selecting "Don't have a PayPal Account ?" In Malaysia, PayPal accept Visa/MasterCard credit and debit card. Visit PayPal at www.paypal.com for more information. We offer FREE standard delivery (single drop destination) with order value above RM500.00 in single transaction to areas within Klang Valley. Order value below RM500.00 is subject to delivery charge of RM120.00 per trip to areas within Klang Valley. Our Standard Delivery Service is performed from Monday to Friday (9:00am to 6:00pm) excluding Public Holidays. In order to optimize our delivery service, we do not accept appointment setting (specific time and date fixing). However, our delivery personnel will contact customer before reaching the place. As option, you may try our Premium Delivery Service whereby appointment can be set. Our Premium Delivery Service will be charged at RM300.00 per trip (single drop destination) with order value below RM3,000.00 in single transaction to areas within Klang Valley. Order value above RM3,000.00 will be charged at 8% from total value. We shall allocate a lorry just to deliver your order ! Appointment can be set once the goods are ready for delivery (refer to our delivery lead time at each product page). Our Premium Delivery Service is also performed from Monday to Friday (9:00am to 6:00pm) excluding Public Holidays. We do not deliver to PO Boxes address. We also offer FREE installation in conjuction with the delivery service as stated above. For areas out of Klang Valley, additional charges is incurred. 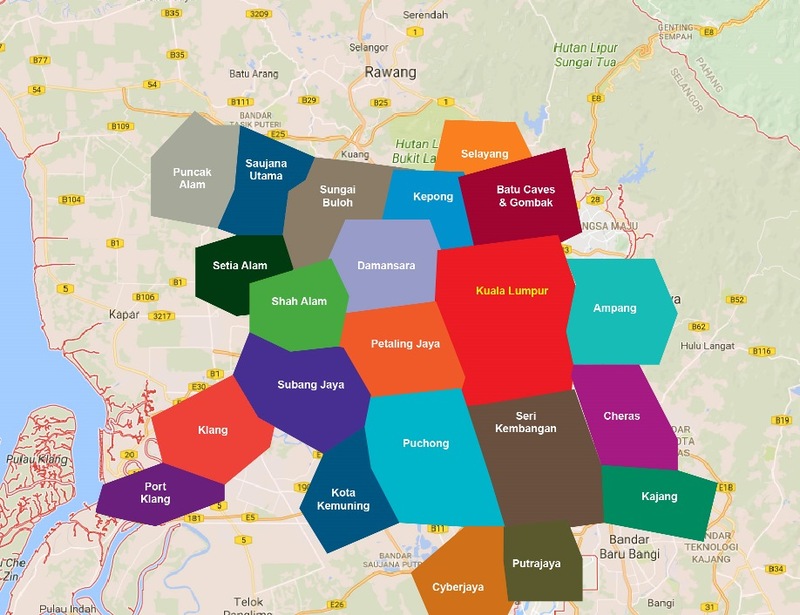 Please refer to the map above for our installation coverage within Klang Valley. a) Wrong items had been received. b) Damages or defects to the items. For any reason should you wish to return your item(s), you have 7 days upon receiving the item(s) to return your order. Please contact office2u’s Customer Service to initiate the return. For refunds via Online Banking, Credit Cards as well as PayPal, it will take 5-14 working days for your refund to be reflected into your bank / credit card / PayPal account from the day your refund was initiated. The information provided should match specific information in our database. Office2u Malalaysia as ("Seller") warrants any and all of its products against manufacturing defects for period of 400 days from the date of substantial completion. Seller will repair or replace any product, which fails under normal and reasonable use of which the product is intended for. Damage or repairs arising from abuse, accident, vandalism, or alteration of the product from its original conditions, shall NOT be considered as manufacturing defects. Changes in surface finishes, including colorfastness, due to aging or exposure to light. Marks, scars, or wrinkles occurring naturally in leather. Veins, marks, voids, fissures, or cracks found naturally in stone. Failure resulting from normal wear and tear. The matching of colors, grains, or textures of natural materials. The colorfastness or the matching of colors of textiles, including an exact match to cuttings, samples, or to swatch cards. Damage, marking, or staining of veneer surfaces due to contact with rubber or similar compounds. Damage from sharp objects or imprinting from writing instruments, or prolonged exposure to direct sunlight. Damage, marking, or staining of cushions due to prolonged exposure of weight stacked on top (stackable chairs). Discoloration of any light-colored textiles due to soiling, stains, or dye transfer from clothing including denim. Foreign objects abrading fabric over time. Damage, expanded, marking or staining of laminated chipboard wood top due to exposure to liquids. Products that being classified as Special made, Custom made, or unwarranted. Please write to office2u@ymail.com to schedule a warranty service. During 400 days of purchase, Office2u Malaysia provides complete warranty and free labor service. After applicable warranty period, Office2u Malaysia will still continue to provide service support. Parts, transportation and labor shall be sole responsibility of buyer. Unless otherwise noted, all materials, including images, illustrations, designs, icons, photographs, video clips, and written and other materials that appear as part of this Site, in other words “Contents of the Site” are copyrights, trademarks, trade dress and/or other intellectual properties owned, controlled or licensed by Office2u Malaysia. All comments and feedbacks to www.office2u.my will be remain Office2u Malaysia's property. User shall agree that there will be no comment(s) submitted to the www.office2u.my will violate any rights of any third party, including copyrights, trademarks, privacy of other personal or proprietary right(s). Furthermore, the user shall agree there will not be content of unlawful, abusive, or obscene material(s) submitted to the site. User will be the only one responsible for any comment's content made. User shall agree that Office2u Malaysia may send newsletter regarding the latest news/products/promotions etc through email to the user. The user shall agree to defend, indemnify and hold Office2u Malaysia harmless from and against any and all claims, damages, costs and expenses, including attorneys' fees, arising from or related to your use of the Site. Any access link to third party sites is at your own risk. www.office2u.my will not be related or involve to any such website if the user's content/product(s) got damaged or loss have any connection with third party site. From time to time, there may be information on www.office2u.my that contains typographical error, inaccuracies, omissions, that may relate to product description, pricing, availability and article contents. We reserve the rights to correct any errors, inaccuracies, change or edit information without prior notice to the customers. If you are not satisfy with your purchased product(s), please return it back to us with the invoice. Please check out “Return, Exchange and Refund Policy”. This agreement is effective unless and until either by the customer or www.office2u.my. Customer may terminate this agreement at any time. However, www.office2u.my may also terminate the agreement with the customer without any prior notice and will be denying the access of the customer who is unable to comply the terms and conditions above.